We really did drink right out of streams, decades ago. When the general practice of purifying drinking water started, we used iodine tablets or boiling. The arrival of pumped filters was revolutionary. Now many more choices of water purification are available, at much lighter trail weights. As I focused on reducing my load, I switched from a pumped filter to Aqua Mira. This is a two part chlorine dioxide water purification system. You add the prescribed number of drops from vial A and vial B to a mixing cup. You wait 5 minutes for the mixture to turn yellow and then add it to your water. In 30 minutes the water is safe to drink, unless the water is really cold. It is effective and low cost. Two full bottles, with mixing cup weigh 3 oz. and cost under $15. It will last for a season or more – 30 gallons. You can save even more weight by buying two very small dropper bottles to carry instead the full sized ones. I used this system for a season, but didn’t like the counting of drops, especially when treating 3 quart batches and then sitting around for 5 minutes for the mixture to activate. I found an equivalent product in tablet form, now sold as MSR Aquatabs. One very small tablet will purify up to 2 quarts of clean water. If the water has an organic load, the dosage rate needs to be higher. I am fortunate to have lots of clean running stream water around, so this has not been an issue. Treatment costs are higher. A pack of 30 tablets costs about $13. I use the tablets at a rate of about 1 per 1-1/2 quarts of water to match the size of water containers I carry. One tablet goes into a 48 oz. soft canteen. Two are used for a 96 oz. one. So I get about 11 gallons of clean water from a package. Again the water is safe to drink in about 30 minutes. The tablets come in strips of 10 and weigh about 1 gram per strip. There is no fuss or mixing or counting drops. The tablets are very small and extracting them from the foil strip is not a job for thick fingers. This has been my current system for over a year. Two systems I have not used are UV sterilization (SteriPENs) and gravity filters. Both have higher trail weights than my current system. The SteriPEN system requires battery maintenance and typically is used with a hard sided lexan water bottle. I carry Nalgene soft canteens, which still have large mouths for filling, but weigh less. Gravity systems require you to carry a large “dirty” reservoir to feed the filter, again weigh more. In a lifetime of drinking water with a variety of treatment levels, I have never contracted an intestinal illness. This statement contains a number of implied disclaimers. I have traveled in areas of pretty clean water. It is a population sample of one. I don’t get sick a lot generally. Consequently, when picking your water purification system, consider the job it needs to do and pack accordingly. 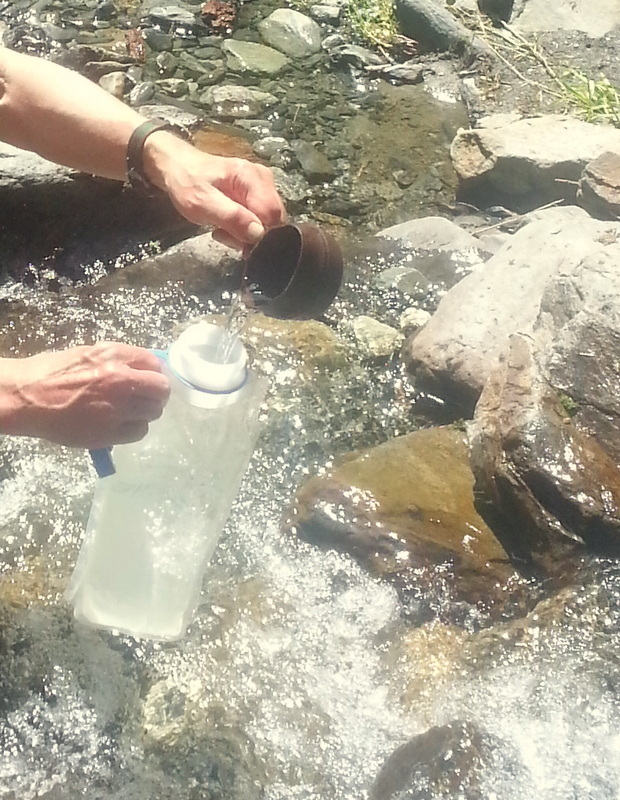 The US Center for Disease Control has a good bulletin about backcountry water purification. In practice I carry a 48 oz. Nalgene soft canteen as my on-the-trail hydration. As it empties, I will stop at a stream, drink the last of it and refill. I carry a light folding cup, which stays “dirty” to use for filling my water containers. I can dip the cup into shallow streams or hold it under small cascades where my larger container would not fit. I can lift water from below the surface of ponds and minimize the collection of surface debris. When the container is full, I add my tablet(s) and wait about 5 minutes. After that time, the tablet has dissolved and the treatment level is active. I then invert the container and loosen the cap to let water flow around the threads to treat this area as well. Then 1/2 hour later, I have potable water. In camp I fill the 96 oz. soft canteen for cooking use, minimizing the number of trips to the water source. This entry was posted in Food, Navigation & safety and tagged Aqua Mira, Aquatabs, chlorine dioxide. Bookmark the permalink. Thank you so much for doing this blog. It is clarifying much for me. I am eager to try out your suggestions. Another question for you: hiking in the Olympics, do you concern yourself about bears? bring bear spray? or a bear canister? both are so heavy. Do you hang your food? Sharing your experience and thoughts on this would great.